The PH1083DBR Series of high-power edge-emitting lasers are based on Photodigm’s advanced single-frequency laser technology. It provides a diffraction limited, single lateral and longitudinal mode beam. Facets are passivated for high-power reliability. 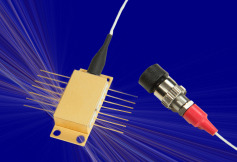 Applications for the 1083 nm laser diode include fiber amplifier seeding, spectroscopy, difference frequency generation, and low power DPSS replacement. The Spectroscopy Series 1083 nm laser diode is certified to be resonant with the metastable helium line.